Do you wish there was a way to take your power back? Do you find self-defeating thoughts are controlling your life? You can stop being a victim and take control of your life today with this hypnosis program from Erick Brown. "Stop Being a Victim Hypnosis" will remove disempowering thoughts and beliefs from your subconscious, clearing way for self-confidence. Subliminal suggestions for deep relaxation and positive change will be received by your subconscious, increasing your self-esteem and filling you with empowering energy. Why wait another day? 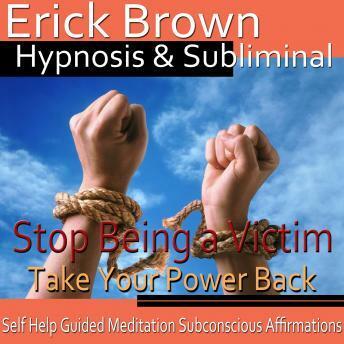 Take back control and stop being a victim using Erick Brown Hypnosis. -This subliminal bonus track can be used with your hypnosis program or on its own for a deep, restful sleep. Binaural beats and solfeggio tones relax your brainwaves and body, melting away tension and stress.